This is an update to a post from a few years ago on playing Dark Castle in Windows. 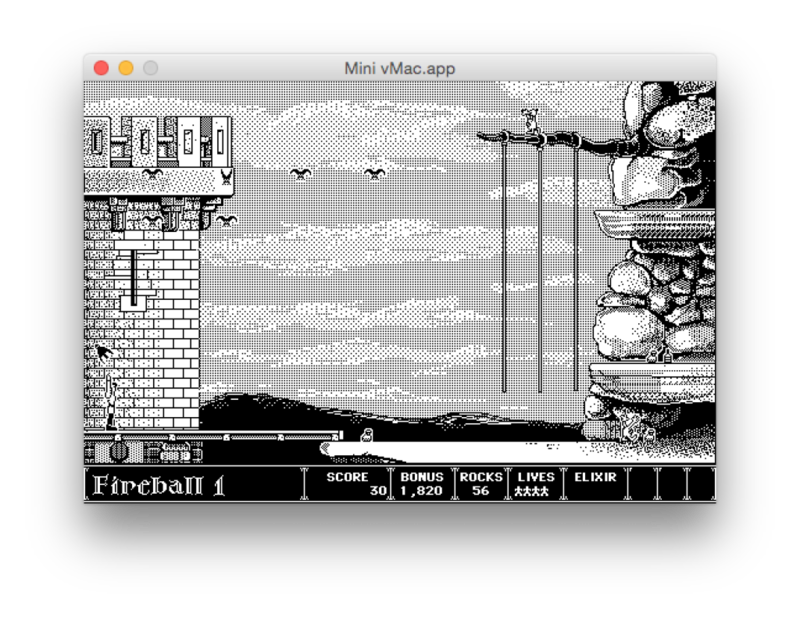 I had the urge to play Dark Castle last week, but I needed to update the archive to contain the Macintosh emulator for Mac OS X as well. Inside the archive you’ll find images for Dark Castle and Beyond Dark Castle, two of my absolute favorite games to play in the mid 80s on old Macintoshes like the Mac Plus. Follow the steps below to enjoy these games on modern OSes. Run the Mini vMac.exe or Mini vMac.app executable, depending on your OS. Mini vMac is is a Mac Plus emulator which is freely distributed. Mini vMac requires a ROM image from a Macintosh Plus to run, which I’ve provided as well. Once you’ve started Mini vMac, you are effectively running a Mac Plus with no operating system installed. I created a disk image with System 6 already installed. Go to File > Open Disk Image within Mini vMac and open the file Disk603.dsk or drag the file into the Mini vMac window. Now that System 6 is up and running, we need a hard drive available to install software and save data to. Just like the previous step drag the included file, hfs10M.DSK into the vMac window to mount the 10M hard disk image I pre-loaded with the Dark Castle software. Run the Dark Castle executable to start the game. For Beyond Dark Castle, mount the BDCImage.hfv file and run the game from there. I bet you can hear the game sounds already 🙂 Enjoy! This entry was posted in Games on October 11, 2015 by bsterne. I’m so grateful for this and I love this game. But on my mac (OS 10.10.5) the keyboard is not fully recognised; for example, the ‘D’ doesn’t repeat when held down, and I can’t crawl forward or crawl backward by holding ‘A + E’ or ‘D + E’ simultaneously. Duncan ducks down but doesn’t move. Is anyone else having the same problem? How do I make sound work with the mini vmac? Thanks!